He was going to stop wearing it, but today he's got a fresh coat of glitter. 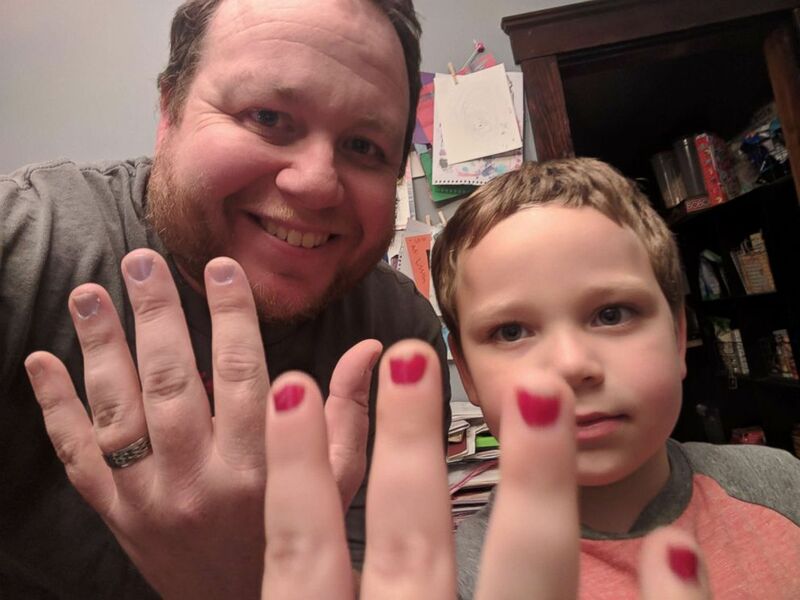 When 5-year-old Sam Gouveia came out of kindergarten and "collapsed in his mom's arms sobbing" for wearing nail polish to school, his father was not happy. "He called me at work," Aaron Gouveia told "Good Morning America." "All the other kids were saying 'what are you doing,' and 'take that off, you look stupid.'" Sam, his dad said, "is an extraordinary kid. He has no concept of shame over nail polish." His grandmother, Gouveia's mom, used to be a manicurist and painted Sam's nails often. I used to wear blue, blue with polka dots white. I like that, that's what grandma gave me. So Gouveia, who in addition to be the dad of three boys and an executive at a public relations firm is also the dad behind the site and social media accounts called the Daddy Files. He took to Twitter to express his rage at what he called #ToxicMasculinity. And the response was "overwhelming positive." It was the response from strangers that gave Sam the courage to keep his nail polish on. Because after school that day, his dad said, he wanted to take it off. There were men and boys supporting him and once it clicked they were doing it for him his face lit up and that pushed him over the edge. His parents convinced him to sleep on it. And when he woke up Tuesday, his dad said, Sam was "50-50." But then Gouveia read him some of the comments on his now-viral tweet. (Courtesy Aaron Gouveia) 5-year-old Sam Gouveia was bullied for wearing nail polish to school. "There were men and boys supporting him and once it clicked they were doing it for him his face lit up and that pushed him over the edge." On Tuesday, Sam walked into kindergarten with his nail polish on. In a video he made for "GMA," little Sam said he "felt bad because he had never been made fun of before. They said 'you should wash that off.' I really didn't like that." He said he "asked them to stop but they wouldn't. My assistant principal said I was using really great strategies." He was happy to wear nail polish on Tuesday, he said. "They have a little bit of glitter on it." Sam said he wants to wear nail polish "sometimes, not forever." "I used to wear blue, blue with polka dots white," he said. "I like that, that's what grandma gave me." Gouveia said he hopes the viral Twitter thread educates parents on how the way we talk to boys can be like "death by a thousand paper cuts." "Things like 'don't throw like a girl,' as if being like a girl is an insult. Having feminine traits is not a bad thing. I hope parents take that to heart." Things are all good in Sam's kindergarten classroom once again. "No one made fun of him and the school stepped in and talked to some of the kids to redirect insults into questions and then eventually compliments," his father said. 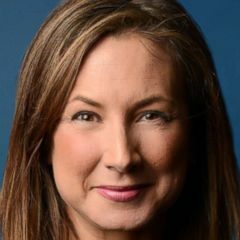 "And community members have also been great, asking if they can give Sam free manicures and dropping off nail supplies." Amidst all of the heartache that came to Sam on Monday, there was one bright spot. Of all the kids in his class, there was one little boy who stuck up for him and stood by his side. "Be the parent who raises that one kid," Gouveia said.